Johan Mostert is a wheat farmer who doesn’t play golf. Instead, he says, he makes wine. Surprisingly good wine. In a fairly unusual place. 100km up the N7 just south of Piketberg, to be precise. On a farm called Nieuwedrift. He’s not quite alone in his winemaking pursuits – the unmissable ostentation of Org du Rac is just across the road – but his rather more humble set-up is still a fair way from his more numerous Swartland neighbours and a considerable distance from his Olifantsrivier compatriots further north. This year he’s launched his maiden 100% Chardonnay MCC as well (R75 ex-cellar). He’s also made a Blanc du Noir from his Shiraz for the first time (R33). 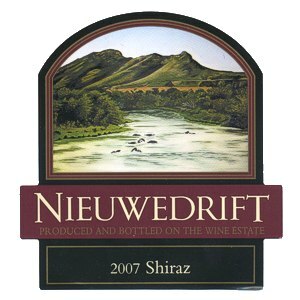 So that’s a small but perfectly honed set of four offerings from just three varietals – Nieuwedrift Chenin Blanc, Blanc du Noir, Shiraz and MCC. Farmer Mostert is nothing if not enthusiastic about his “hobby”. The farm is kitted out with a purpose-built tasting venue, complete with an eclectic mix of his wife’s equally enthusiastic art. There is also a guesthouse. They cater for weddings and conferences. There are walks. And there are cellar tours. But back to the wines for a moment. Farmer Mostert has been to the local Mooresburg show and is, by his own admission, a little the worse for wear – whether through imbibing too much of his own handiwork, it is not made clear. But imbibe it I must. In fact, he insists – as I am, I suspect, the only customer that day – that I buy the very last bottle of last year’s 2009 Chenin Blanc if he opens it. At R20, it seems churlish to protest and, luckily, it’s completely quaffable, as is its younger and slightly fresher sister, the 2010. Not being by any means an expert on red wines, it’s hard to place the Shiraz. A 2007 vintage on the easy drinking side, it has a pleasantly peppery nose and quaffability but no great depth or finish. However, it’s not without some ageing potential either: indeed, its maker proclaims on its back label that another two years will do it good. Matured for 18 months in a mix of new and old fill French oak barrels, this mildly purple brew has clearly benefited from the searing temperatures that this area reaches in summer, although, to be fair, there is a cooling breeze from the West Coast at times as well. But overall, as with the Swartland, we are a long way from either altitude or coastal breezes. Even on an early spring day, the temperature was in the high 20s. Red ought to be good here – and at R40, it’s certainly good value. It appears that the 2007 might have gone up in price since I was there, though, to R50. But to get to the bubbles… the MCC is not made from grapes grown in Champagne temperatures or soils – more sand than chalk, more searing heat than cloying cold. But he does say it is made in the French way… It’s 100% Chardonnay so it’s light and lemony, perhaps a bit too much so on opening, but it broadens on acquaintance and its painstakingly hand-turned bubbles do justice to the enthusiasm of its maker. And it’s bone dry (residual sugar just 2.5%). Furthermore, it’s only the second MCC in the Swartland region after Riebeek Cellars Kasteelberg MCC, also 100% Chardonnay. It would be good to compare the two, but for now let’s leave it in the hands and words of an amorous Green Point couple I targeted to try it… “Excellent wedding material” they said, something that will warm the cobbles of Mnr Mostert’s heart, as he is adamant that it is made for smoked oysters, starry nights and the temptation of West Coast ladies… it’s best not to ask more. (information above courtesy of Platter’s South African Wine Guide 2010).